Your shower head has started leaking and dripping water, what is the easiest way to repair this? There could be a few different things wrong. 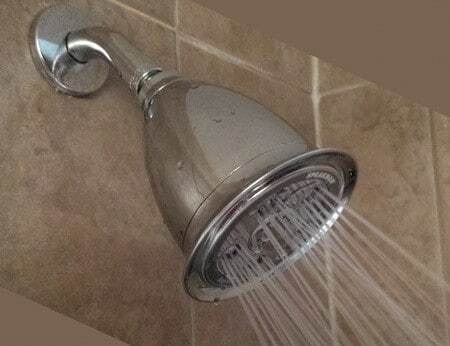 We will start with the most likely problem that could be causing your showerhead to leak. We will show you why your shower head is leaking or not functioning properly when water is being supplied to it. If your shower head is leaking ALL THE TIME, then see the bottom of this page for ways to fix that specific issue. Lime deposits and hard water cause clogs and are a common reason a shower head will leak when water is being supplied to it. If the shower head water nozzles are clogged up from hard water deposits (Calcium and Lime) the water will be forced to come out somewhere else. Usually from the area where the shower head screws on to the water pipe coming out of the wall. If this is the case when you turn on the shower, then it needs a good cleaning. 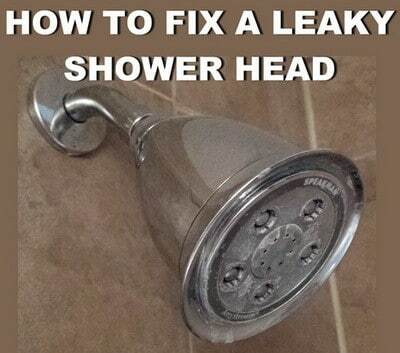 With the water off, get a wrench and unscrew the shower head until it is removed. Get a glass bowl and fill it with vinegar. 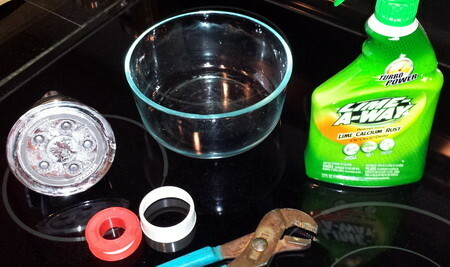 (Lime-Away and CLR work too) Put the shower head into the bowl and let soak for at least 2 hours. Vinegar is the safest to use when doing this. If you use CLR or Lime-Away it can strip the metal finish off of the shower head so use caution. 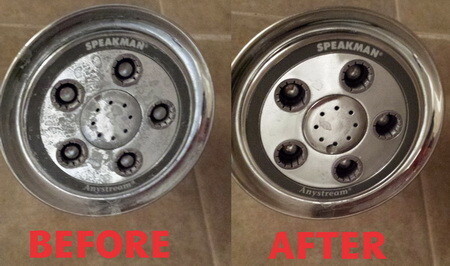 If your shower head is all plastic, then you can use any hard water remover without worry. Pour some of the lime-away or vinegar INTO the shower head also. 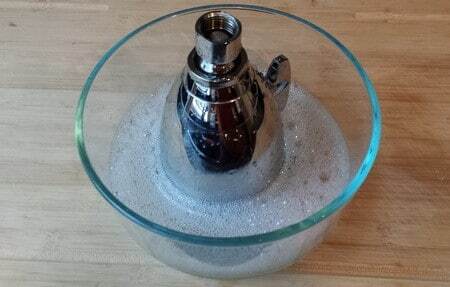 If the vinegar did not fully remove the lime and mineral deposits, then you can use a toothpick to remove the gunk in the shower nozzle holes if needed. While the shower head is soaking in the cleaning solution, add some fresh plumbers tape (white teflon tape) to the shower pipe fitting in the shower. This will help to make a “seal” so no water sprays out in this area. Once the shower head is clean (and after teflon tape is applied to the shower fixture arm) reinstall the shower head and test for leaks. Another reason for leakage is a worn or bad O-ring or rubber washer. 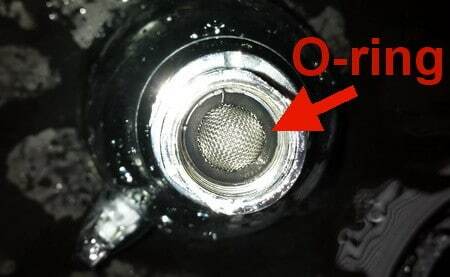 To check to see if this is causing your problem, remove the shower head and look inside for the O-ring. If it looks cracked, ripped or distorted, you will need to get a new one at a plumbing or home improvement store. 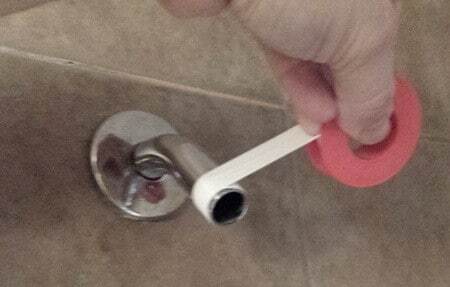 Replace the O-ring by inserting it into the shower head. Once everything is clean and serviceable, put new teflon tape on the shower fixture arm and reinstall the shower head. Once the shower head is reinstalled, do a test for leaks or dripping water. Make sure you tighten the showerhead onto the shower fixture arm tightly. If it is still leaking try tightening it more. 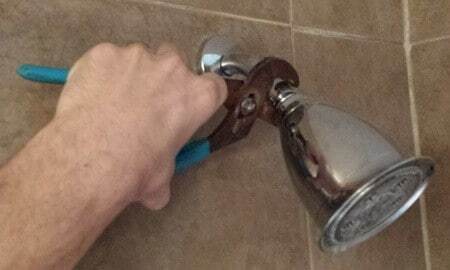 If the shower head is leaking ALL the time, check the videos below on the easiest way to fix this yourself.